In the past year I’ve written two different blog posts on the idea that we’re always “on stage”. While not the main focus of this blog, the idea of influencing people when we have no idea the impression is being made strangely weaves its way into the following story. Last weekend I attended a leadership event for Pruvit called EPIK in Dallas, TX. Patrick Sweeney, one of the guest speakers on Saturday, talked about the crippling power of fear to control our lives. Fear is a terrifying enemy commonly known and yet little understood. In our society today we are technically safer than ever before and yet the vast majority of people live in fear to the point of it driving and controlling their lives. Everyone has a fear frontier that creates a barrier few are able to pass through. Only a small number are able to harness their fears and turn them into the energy needed to break down the barrier of the fear frontier. The secret to killing fear is to act in spite of it and the two key ingredients are desire and belief. With desire and belief properly channeled, you can overcome any obstacle. With that intro, let’s transition back to last Saturday. 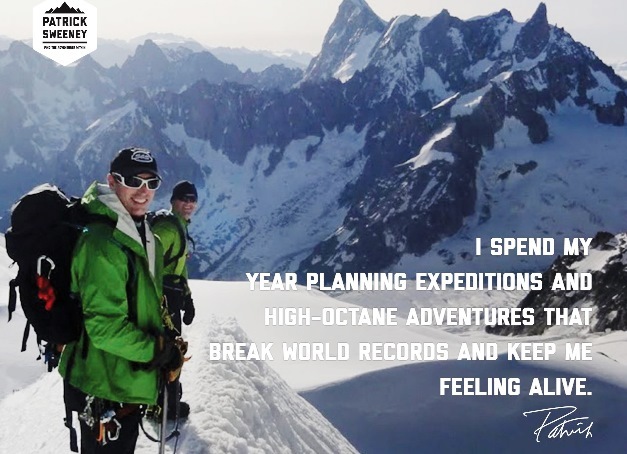 Patrick Sweeney is an adventurist who has accomplished some amazing feats including scaling most of the world’s tallest mountains, overcoming Leukemia, and his deathly fear of flying by learning to be a competitive stunt pilot. His story was inspiring and motivating and I took pages of notes. Little did I know of another member in the audience who was equally moved and also took an interest in me. Sunday morning there was a lengthy line already formed to get in before the doors to the main ballroom were opened at 10AM. With so many people it was a challenge to find a seat and I ended up sitting next to a very nice lady named Mary from the Houston area. There were literally people from all over the country and world with the farthest being from Australia so meeting a local Texan was pretty cool. Mary and I immediately hit it off and had a great conversation running between speakers. After the lunch break, she shared something that started the day before that really took me off guard. Going back to the talk on fear, Patrick asked the audience about our biggest regrets. Mary shared that one of her biggest fears has been the lack of self confidence in meeting total strangers. She said she’s really missed out in life because of her lack of personal belief. Oddly enough, on Saturday she had noticed me across the isle and said it struck her in the heart to go and introduce herself to “me” because she thought I looked important. Ultimately fear got the best of her and she never made any move towards me. Wow! I was humbled at the compliment and blown away that it happened again where someone was watching me when I had no clue. The good Lord definitely has a sense of humor and apparently thought Mary needed a crash course in overcoming her fear of meeting strangers. What is the likelihood of me sitting next to her on Sunday? With several thousand in the room, the odds were minuscule and yet we ended up together for the entire day. I asked why in the world she was intimidated by me and her reply was just my look (professional dress) and air of success. Fortunately I was able to show how her fears were totally unfounded and it was a great learning experience for us both. I feel like she took a chink out of fear’s control of her and I was reminded yet again how we are always on stage influencing people even when we have no clue. When it comes to facing and overcoming your fears, there’s something to be said for taking bold action. All the planning and thinking and figuring in the world will do you little good until you take action. Do your homework and formulate your plan and you will be amazed with the abundance of resources and support that come to you by simply taking action. You will never perform beyond the level of your belief…so fortify it and move! This entry was posted in attitude, Entrepreneur, Health & Fitness, ketogenic diet, leadership, living your dream, Nutrition, personal development, Pruvit, success, Uncategorized and tagged #diet #health #fitness #wellness, attitude, leadership, personal development, Pruvit, success, Zig Ziglar. Bookmark the permalink.